The modern workplace is changing. For many, work doesn’t look like the stereotypical cubicles and water coolers. Offices are adapting with technology to maximize productivity and make the workspaces more compact and modern. Less is more with the modern office, so the more that you can get from simple items like desks, computers, and more, the better. It’s ideal for offices today to be aware of the changes occurring in technology. If an office is lost in the past, it’s likely that someone else in their field or trade will pass them by through technological awareness and savvy moves towards the future. A few things make modern offices different from those of the past. The first being the amount of paper being used nowadays compared to the past decades. Many businesses, in an attempt to be green as well as save money and resources, have begun to go paperless. This means that less space is taken up with filing folders, and more resources are being saved. If you’ve worked an office job before, you know that there’s a lot of paper that gets used, and much of it is wasted or wasteful. A memo with a few lines of text is not necessary for the era of Outlook and other email software that allows you to communicate with co-workers immediately if not face to face. For many, paperless moves have been made, and office spaces are better for it. The amount of trees and other natural resources that are saved from the lack of paper in a workplace is priceless. Sure, maybe you’re saving a few thousand bucks a year, but consider this: money comes and goes much faster than trees do, and the more that get chopped, the less we have to use and utilize for their natural purposes. Offices are also moving towards telecommuting. For those of us who work from home, there are benefits and negatives to it, but no one can deny that more jobs exist today that do not require the employee to leave home. For parents, the disabled, and others, this is a great opportunity to still keep a 40-hour job but stay at home for various reasons. A few issues can arise of course. Communication is less clear over the internet or online, but face chatting such as webcam messaging is helping to solve that issue. Other issues might be resources. You have much less at your disposal at home than you do in a busy office space. Let’s be honest: the negatives are there, but being able to work from home is an amazing opportunity. If you have the right resources, you can usually work any job from home. Many places do not hire telecommuters, however. Chances are that will change in the next decade. While some jobs will not transfer to the remote location trend, others will begin to look at the cheaper alternative that comes with telecommuting. Not having to host as many people means paying less in office rental space, and for commuters, saving that money on gas is a huge plus. While the kinks are still being worked out, it appears that the trend of telecommuting is growing into a norm that will likely shape the working world for years and decades to come. Another modern office trend is the idea of smart devices. Not just computers or phones that allow you to connect to the internet and apps quickly, but ones that know what you need and how you want to receive it. For many offices nowadays, things like smartphones are a no-brainer. That goes for computers as well. Many offices buy newer computers every other year or so to make sure they’re keeping up with not only new technological advances but also competitors. The modern business world is more competitive than ever thanks to the internet and global markets becoming so influential. One thing that is often looked past however is the idea of smart technology in our office furniture. Many offices have laptops, computers, tablets, and smartphones. But how many offices are embracing and investing in AI? Not many small companies can do so, but there are ways to get integrated with AI in the workspace that don’t break the bank. Artificial intelligence is largely a new realm in which offices are exploring. The idea of AI is to allow technology to do some of the thinking for you, whether it be assisting in searches, allowing you to find documents more quickly, and even sending messages for you to save time. That’s just it: time is key in a business or office. So what’s a great way to save time? Well, finding AI to do the things you don’t want to worry about is one. Things like reminding you of meetings, adjust thermostats and even make coffee. A single place to manage all of these aspects of the office, the intangibles, would be great in making sure you’re maximizing your effectiveness. A lot of these things are done in different spaces. Your phone might keep your schedule, maybe a tablet for the office does temperature and other housekeeping things. The idea behind AI, however, is that all things would be done in the same place. That’s where it’s important to look for a one-stop shop for all things AI and office management. Time is key in business, and finding a way to maximize your productivity while staying organized and in place is essential to allowing yourself the space to succeed. There’s an option for those looking to get an AI-style experience in the office, and best of all, it’s affordable and often essential to any office space. Whether you’re working from home or utilizing a traditional office space, you’ll need to pay attention to this amazing piece of tech. If you’re looking for an AI interface that’s practical and easy to use, look no further than the Autonomous Smart Desk 3. The desk comes in three colors to match any office space. Grayscale for mellow tones, black for bolder offices, and white for the sleekness any modern office desires. The surface of the Smart Desk 3 is clean and contemporary, a look that mixes well no matter what your office looks like. With room to spread and organize as you see fit, while also maintaining a compact design, the Smart Desk 3 is a great tool for your organizational skills. The ability to organize is one thing, but it often takes multiple different tools and contraptions. The Smart Desk 3 allows you to organize on your desk itself without paper trays and other nonsense. The surface of the Smart Desk 3 is sustainably built and built to last. Often, it’s assumed you sacrifice one or the other: durability or sustainability. Not with the Autonomous brand. For a desk that looks simple and sleek, it’s built using complex designs and scientific processes. A stable MDF core allows for maximum weight bearing and no warping or cracking over time. With a uniform design and finish that is also scratch-resistant, the Smart Desk 3 is your key to staying modern and also investing in a desk that grows with you over time thanks to minimum damage. The Smart Desk 3 is also designed for all users. The rounded edges of the desk mean you’re not confined to the typical rectangle shape that assumes you don’t need extra space. That’s not an assumption that should be made for you. Pain-free support to the desk as well as reduced contact-stress means no matter your condition, posture, or size, the Smart Desk 3 will fit your needs and your body. The desk itself is built out of industrial-grade steel, meaning it moves silently when you change your layout, performs efficiently and does not wobble no matter what its holding. A 5-layer paint finish and solvent-free powder mean that your desk is finished with a look that is equal parts green and eco-friendly while also being easy to look at. As far as the AI goes, your abilities 7” touchscreen intelligent interface supports 10 finger touch and an onscreen keyboard to give you full functionality without the need for a physical keyboard or mouse. The AI capabilities of the Smart Desk 3 are run through a tablet built into the desk. With a 7” touchscreen display, you can use all 10 fingers on its 800×400 resolution to choose a variety of assistance-based office tasks that make your life easier. A lot of the shortcuts you will be using with the Smart Desk 3 are built in already to your desk. The most popular function on the Smart Desk 3 is the sit to stand function. Let’s say you know you’ll be in the office for a long time. Research shows that sitting for too long has negative consequences, and with the touch of a screen, you can adjust your desk to be at standing height without having to take a single thing off your desk before the move. The Smart Desk 3 can remember 3 of your height preferences and keeps you focused and fit by allowing you to stretch your legs and work while on your feet. The Smart Desk 3 also can order you a ride to your next appointment or even to lunch. By learning your schedule, the Smart Desk 3 can actually call you an Uber if it knows you need to be somewhere in the afternoon. For the last minute meeting, you are seamlessly connected to a rideshare app to make sure you make it to your next destination on time. Another popular function is the ability to order lunch for you. If you have a favorite spot, the Smart Desk 3 can order your go-to meal for you at the same time every day, or you can even switch it up and try something new. The ability to manage your daily schedule with the Smart Desk 3 are limitless, and you’ll enjoy finding new functions and features as you get acclimated to your AI desk. Lastly, the operating software of the Smart Desk 3 is built by Autonomous to work with all smart devices. No favoritism, if you have an iPhone but Android office materials, you can connect them all to one place and not worry about making everything match. By connecting to every one of your devices, you can work smarter and not harder. Other functions like controlling lights, heat and A/C, reminders to drink water, and even changing office tunes are all done on the desk’s interface. Touchscreen functions allow it to work seamlessly with your movements, and truly, you’ve never experienced a more intuitive AI in the workplace. For a modern workplace to stay modern, AI is the key to not having to pick up a new device every year. 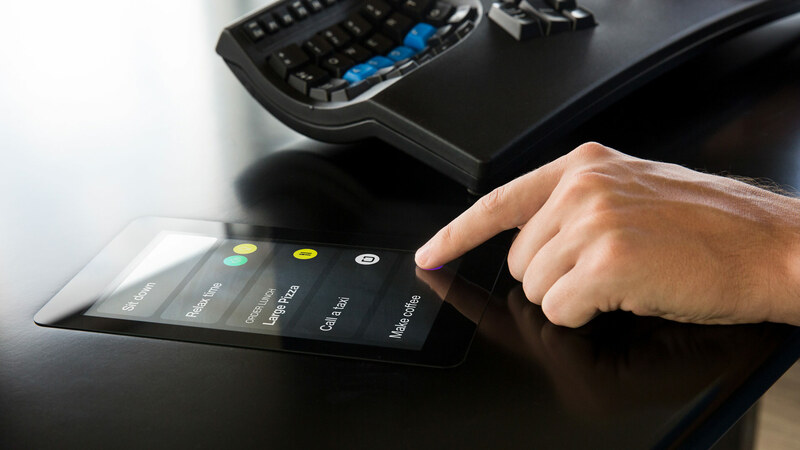 The shortcuts included with the Smart Desk 3 update with the OS, and luckily for users, Autonomous is driven to provide customers with the best experience possible. If you’re working from home, you’ll feel like you have a personal assistant right in your home office. In a traditional office setting, you’ll feel like you have a new coworker. Spoiler alert: they’re going to be the new favorite. Autonomous is the key to modern workspaces. With amazing technologies, the Smart Desk 3 is a wonderful way to modernize your workplace and find the best ways to work. Not to mention, technology is often very expensive when it’s this up-to-date. Luckily, the Autonomous brand keeps things affordable and with some ability to keep costs down by purchasing for an office. Multiple standing desks, multiple discounts! If you’re on the fence, consider this: time is money. Saving time saves you money and gives you more opportunities to make connections, secure funds, and move forward! At the very least, the Smart Desk 3 should be a goal, if not a purchase you make today!